These are not your father’s Steinbrenners. For that matter, do they appear to be their father’s Steinbrenners. In four days it will have been two years since George Steinbrenner died, and in that time his sons Hank and Hal have run their inheritance like a private vehicle for the only thing they seemed to have inherited from him: knee-jerk petulance. Their Dad grew out of its most virulent form by the time he was 60. The sons don’t seem to be moving that quickly. It’s about the mildest form of the truth: that when combined with Rodriguez’s tone-deaf personal conduct at every stage of his career and his track record of getting smaller as the stage gets bigger, his admission of PED use – at minimum while with Texas – might be enough to give the voters the excuse they almost to a man dream of, of denying him a spot in Cooperstown. …according to two sources familiar with the team. The comments were published at an inopportune time, when the Yankees were in Boston for a pivotal four-game series against the rival Red Sox. The punishment is not an outright ban, one of the sources said, but the Bombers felt that Jackson took a shot at A-Rod that was below the belt when he said that Rodriguez’s admitted performance-enhancing drug use “does cloud” A-Rod’s records. Of course the absence of a Steinbrennerian reference simply serves as circumstantial evidence that it originates from one of them (the bet is Hal – Hank had the presence of mind to step slowly away when he sensed he was slightly overmatched trying to do his father’s job). The next best reason for conclusion-jumping here is reached by asking yourself who else would’ve had the power to ban the Yanks’ last, best, living connection to the days George Steinbrenner resurrected the moribund franchise in the late ’70s. You think General Manager Brian Cashman did this? The gnomish Chief Operating Officer Lonn Trost? Of course it could’ve been Trost’s idea. The latter source quote noted above (“The team doesn’t need any negative publicity or aggravation…”) is just dense enough to be something from him. What on earth did the Yankees just get themselves besides negative publicity and aggravation by banning Reggie Jackson just as the storm-in-a-teapot over his comments to SI had faded completely from consciousness? Who on earth would have let this wet blanket land on the eve of the All-Star Game? But even if he did dream up this chicken spit and convince Hal Steinbrenner it was salad, Trost is not likely to have given the story to The Daily News. Just two months ago he demanded that Major League Baseball actually investigate the newspaper for another story, co-authored by the impeccable Bill Madden, that the Steinbrenners were exploring selling out. The key to the saga is the necessity of protecting Rodriguez, even at the cost of alienating and publicly humiliating Jackson, who spent only five of his 21 major league seasons in New York but is now high on the list of retired stars identified solely with the Yankees. Mr. Red of The Daily News refers to Rodriguez as the “star third baseman” and while that’s what the Yankees desperately need people to think this year, and next year, and the year after that, and all the way until 2017 when his noose of a contract finally runs out, it is hardly still the case. This is a player, healthy enough to have appeared in 82 of the Yankees’ first 85 games, whose On Base Plus Slugging Percentage number falls below the likes of Ryan Doumit, Adam LaRoche, and Jed Lowrie – and just ahead of Chris Davis, thought to be in danger of being relegated to a platoon at first base for Baltimore. Other than structurally I am not comparing the two cases – throwing me out and throwing Reggie Jackson out aren’t in the same universe – but we are beginning to see the outlines of a pattern of the Yankees ham-handedly overreacting in defense of their rapidly rusting former star. 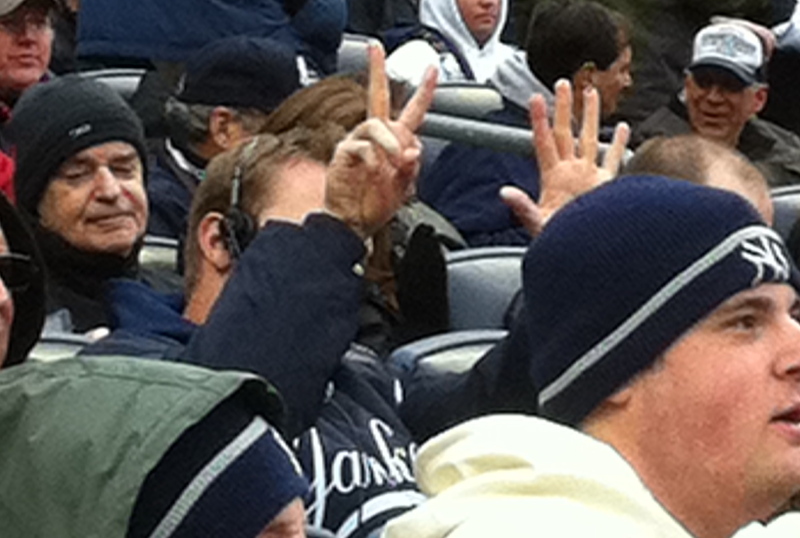 On Opening Day last year I finally got a clear photo from my seats of a Yankee “Coaches’ Assistant” named Brett Weber. 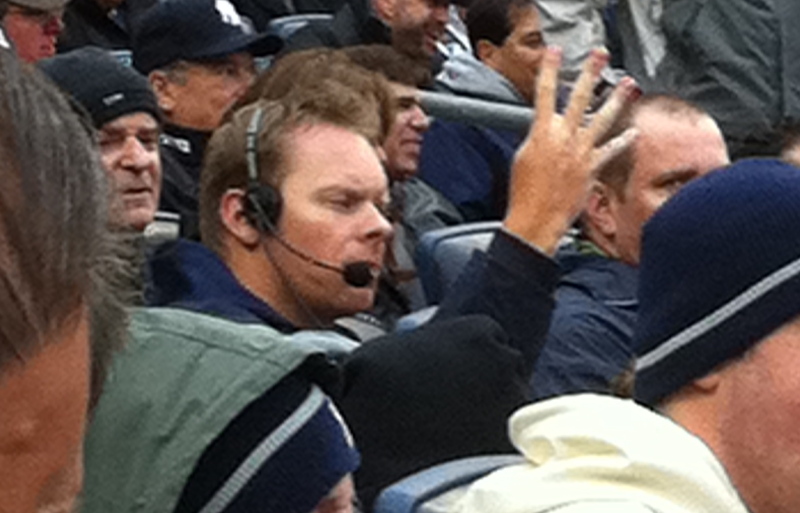 Throughout 2010 he had given hand signals from his own seat right back of home plate to Yankee players in the on-deck circle. Nearly always, this was Rodriguez, who often looked inquiringly towards Weber for some kind of data. Gradually it had dawned on me that Weber was providing Rodriguez with details about the preceding pitch: speed, location, type. But at the opener on a frigid March day in 2011 Weber had elevated his game. He was signaling everything except time, temperature, and traffic conditions on the Cross-Bronx Expressway. The pictures were so inconsequential that I didn’t even blog about them here. I tweeted one shot and explained that Rodriguez was just getting confirmation of what he’d seen. What I thought but didn’t (bother to) write, was that he’s so tense that he needed confirmation from a kid in the stands with a radar gun what pitch he had just seen thrown even though he was closer to the pitch than the kid was. But a newspaper – The Daily News, natch – published the photo two days later and I arrived at Yankee Stadium that morning as the center of attention. Major League Baseball had already instructed the Yanks to not sit Weber or anybody else in the stands. The team had already issued an explanation: namely that the Radar Gun attached to the Yankee Stadium scoreboard wasn’t working that day and so Weber was telling the players something they would have ordinarily known but for a mechanical failure. In the middle of an ad hoc “news conference” in which I insisted that it might be bizarre for a team employee to be giving an active player a kind of hand-signal play-by-play but it didn’t strike me as cheating, who walks over but General Manager Cashman. I’ve only known him fifteen years or more and he decided to make a joke about Weber signaling for beers, and then to explain that it had all been cleared up and Weber would be back in his seat for the next day’s game, and that certainly the Yankees weren’t upset with me for tweeting the photo. I wasn’t happy about it – mostly because Bob wasn’t happy about it – but good grief, the Yankees once fired Babe Ruth, it’s their ballclub and they can do what they want. Even as I chafed at the idea that a ten-year run was over without so much as a phone call or email from them, it still never dawned on me that there was an ulterior motive. Then The New York Post ran a story leaked to them by the Yankees that there certainly was one. The Yankees, the ‘paper’ reported, were avenging themselves against me for having tweeted the Weber/Rodriguez photo. For the last several years, political commentator Keith Olbermann has served as an in-stadium play-by-play man for the Yankees’ Old-Timers’ Day. But the Yankees are making a change, The Post has learned. The Yankees were not happy with Olbermann posting a photo on Twitter earlier this season of a coach signaling pitches to their batters in the on-deck circle. So they decided to bounce the liberal loudmouth and will have Bob Wolff and Suzyn Waldman provide the commentary for today’s game instead. The factual errors in the item (I had never done the play-by-play; the implication that Bob Wolff was somehow replacing me was made by somebody who knew nothing of the mechanics of Old Timers’ Day) suggested this was not Cashman cashiering me, nor the exec in charge of the event, Debbie Tymon. This was further up the chain. Even President Randy Levine insisted to me that the events were unconnected, and that I was a “candidate” to return to help Bob in 2012, and that I’d hear from the club directly next time. And in retrospect this petty little exercise seems like a minor note before the publicity fiasco crescendo of the move against Reggie Jackson. Note that in both cases nothing was announced, just leaked. In both cases there is executive-level action by people who don’t really know what’s going on, and who wind up exacerbating a forgotten story by resurrecting it and publicly blaming on somebody else. And in both cases the motive is to somehow defend Alex Rodriguez. Clearly Rodriguez needs it. After the tweeted photo story broke, an American League manager took me aside to thank me for stirring up the hornet’s nest. “They’ve been doing that for years, even in the old park,” he said. “I’ve complained and complained and complained – nothing. And it was always done for A-Rod.” The skipper added some texture to this by suggesting that the real need for a guy in the stands in a Yankee jacket giving pitch details to Rodriguez and other Yankees was that the team was notorious for flashing the wrong pitch and the wrong speed on the scoreboard (they would hardly be the only team accused of that crime and/or gamesmanship). The sad part about all of this is that in both cases these are amazing over-reactions. The “signal” story went away within 24 hours and Brett Weber returned to his seat (although Rodriguez never again got the benefit of his technically-illegal wig-wagging). Reggie Jackson’s gentle honesty about the fact that Rodriguez is a freakin’ admitted steroid user resonated here in New York with all the impact of a snowball thrown into a pond and ruffled far fewer feathers than his comments about the Cooperstown worthiness of the late fan favorites Gary Carter and Kirby Puckett. Under Steinbrenners: The Next Generation, the Yankees’ front office looks like a bunch of hand-wringing clerks wearing green eyeshades, rushing to defend Alex Rodriguez. You know what George would have done? Nothing. He might’ve updated his infamous derision of Dave Winfield and call Rodriguez “the new Mr. May,” but he would’ve taken the heat – not applied it to others unnecessarily. Instead the Yankees: get another publicity nightmare; underscore the fragility of their third baseman’s ego and the insanity of his five-years-to-go contract; and pull the rug out from under one of their top ambassadors (and one of their guys who actually hit his 500+ home runs without any juice). If Hal Steinbrenner – with or without Lonn Trost – is going to run this hallowed team like a Roller Derby franchise, that other Daily News story had better be true. The Steinbrenners need to sell the club. The Yankees need to be run by some grown-ups with skin of merely ordinary thickness. are the ones they weren’t able to sell. haven’t bought them. And you can now buy many of those high-end tickets at half the original price, except you can’t, because the Yankees gave them away as make-goods. more games’ worth in the $500 section, etc. pay what they agreed to in more halcyon days. Or 75% of that. Or 50%. Because if they can’t, the most dreaded thing imaginable might happen. The Yankees might send out another one of these press releases.